Sony revealed today that the August 2017 PlayStation Plus free games include Just Cause 3 and Assassin’s Creed Freedom Cry for PlayStation 4, Downwell for PS4 and PS Vita, and more. *Note: The PlayStation Blog doesn’t say Super Motherload includes cross-buy with PS4, but the PlayStation Store does. *Note 2: Latin America gets Strike Vector EX instead of Just Cause 3. To get to know more about this month’s PlayStation Plus games, check out our feature detailing each one. As a reminder, That’s You! for PlayStation 4 will remain a PS+ free title until October 24. Additionally, on August 15, the Ravenswood Plus Pack for Dreadnought will be free to PS+ members. It’s valued at $20. The latest round of PlayStation Plus Specials is live on the North American PlayStation Store, letting you save on Persona 5, Resident Evil 7, What Remains of Edith Finch, and more. If you live in Europe, a PlayStation Plus 7 Year Birthday Theme is now available as a free download from the PlayStation Store. 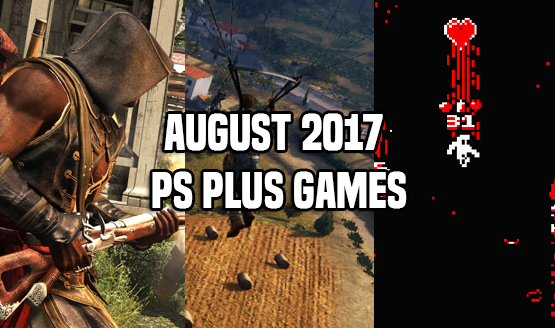 What do you think of the August PS+ lineup?